Michele Corriel is the author of Fairview Felines: A Newspaper Mystery. Click here to read my review. Michele Corriel lives and works in the beautiful Gallatin Valley of Montana surrounded by seven mountain ranges with her rock-hound husband, her teenage daughter, a completely insane golden retriever and two cats. Her work is as varied as the life she's led, from the rock/art venues of New York City to the rural back roads of the Rockies. 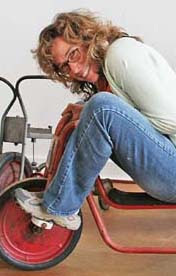 Published regionally and nationally, Michele has received a number of awards for her non-fiction as well as her poetry. When she's not writing you may find her on the golf course, hiking or slagging her way through the snow on what some people like to refer to as "skis." You will never find her weeding her garden. And the only good day fishing is when she doesn't catch a fish! Oh, you middle grade ninja! How wicked of you to ask me to narrow it down like this. Now you will see how much of a cheater I really am: Lord of the Rings (trilogy, including The Hobbit); The Hunger Games (trilogy) – and I never write fantasy, although my mother always tells me, ‘never say never!’ – The Tale of Despereaux, and the Harry Potter books never disappoint. Of course, let’s not forget the classics, like Catcher In The Rye and Holes (is Holes a classic yet?). But why keep it to YA and MG? I have to admit if I were stranded on a desert island I would have to bring Ulysses by James Joyce for the company and some Mickey Spillane for entertainment. And then there’s the graphic novels … hey, wait a minute, I’m not done, bring back my keyboar…d. I wake up in the morning and read for an hour, uninterrupted. I sit down at my desk as close to 9 a.m. as possible and deal with my email, blog, other chores, and try to get to my writing by 10:30. I write for three hours and break for lunch. My afternoons are spent on marketing and errands – hey, someone’s still got to do the laundry! The path that led me to publication was filled with detours, potholes, and lots and lots of construction delays. I wrote Fairview Felines: A Newspaper Mystery a few years ago and sent it out, got rejected, rewrote it, got rejected, and put it away for a little bit. In the meantime I wrote three other novels. I was at an SCBWI conference when I met the publisher of Blooming Tree Press. She asked me to send her the manuscript, then called me with a contract offer. Two years later a book was born. Good question. It’s kind of like the nature or nurture thing. I think all writers are born with a love of reading. What you do with that depends on a lot of things. More importantly, I believe all good writers have a feeling of being an outsider. There’s something about experiencing life from the outside looking in that allows language to ferment. It’s that sort of ability to narrate which really carries over onto the page. Personally, I’ve always loved to read. Practically born with a book in my grubby little fingers, pity the person who tried to pry a tome from my hands. I would sneak Nancy Drew books into my classes and read them while the teacher was doing something boring (like math). I read in the car. On the bus. On the train. In the dark. In the park. Eating green eggs and ham. And by the time I was in kindergarten I’d written my first book. I illustrated it too, but I wasn’t a born artist, that became clear right away. And of course I had a wonderful imagination. That’s what I like to call it. My mother called it fibbing … but we won’t talk about that here. My favorite thing about writing would have to be the rewriting. Because my least favorite thing is the blank page. So once I have stuff written down, once I know where I’m going, sort of, I can get my hands dirty with deep and vicious rewrites. The first time through I’m just getting to know my characters. By the third or fourth revision, they’re in the room with me. First off, I’d say, no, shout: READ! READ! READ! Read everything and anything. Only by reading will you get a sense of what writing really means. Then write. Lots of people I meet say, “Oh, I really want to be writer, but I don’t have the time.” You have to make the time. When I worked a regular job (now I’m a freelance writer, besides being an author) I’d get up an hour early and work on my manuscript before I went to work. And then, if you really believe in yourself, don’t give up. Okay. Again it may be a bit of cheat here but I would love, love, love to have lunch with Thomas Jefferson, James Madison and Alexander Hamilton – the writers of the Federalist Papers, which became the essence of the American Constitution. I’m a huge political science junky and I love thinking about the nature of man vs. the rules we live by. I’d like to ask them what they had in mind when they wrote the constitution and what they would think of our government as it stands today. Great interview, thanks! Anybody who loves Despereaux rocks, as far as I'm concerned--and she's hilarious, to boot! Loved the interview and the format of 7 questions! And Michele is an absolute hoot! I am grateful I've had the opportunity to get to know her through the Montana Chapter of the SCBWI. And she is very derserving of being pulished!